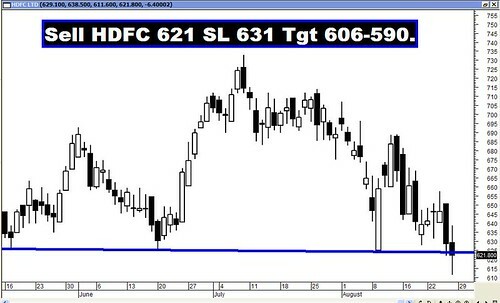 BULLS ON A FAST, BEARS CREATE HAVOC – 26/08/2011. BELOW 200 WEEKS MOVING AVERAGE. It seems that the Bulls are on a fast protesting against increasing inflation, reducing growth, huge FII outflows and high interest rate regime provided by the RBI, even as the Bears are having a field day and creating havoc in the market. Just as Bull markets breaks all Resistances; Bear markets breaches all Supports. We are in the midst of a thriving global bear market and thus it should not have come as much of a surprise that the strong support zone was breached effortlessly. In the process, the market closed below the 200 Weeks Moving Average and this signals that the long term investors have started bleeding. In the last 8 years this is only the second time that the market had a weekly close below the 200 Weeks Moving Average. The last time, the market went below that level was in 2008. The Sensex opened the week at 16155, made a high of 16549, a low of 15765 and closed the week at 15848. The Sensex lost 293 points on a weekly basis. Similarly Nifty opened the week at 4843, made a high of 4965, a low of 4720 and closed the week at 4747. The Nifty too closed with a weekly loss of 98 points. Both Sensex and Nifty have formed a small body black candle with a long upper shadow and a small lower shadow on the weekly charts. In the process, the weekly candle closing is below the 200 Weeks Moving Average. On the daily charts, there is a formation similar to Three Black Crows, but it cannot be called so because the formation has occurred in a downtrend. It has been observed, that after such a formation, the chances of the index being oversold is very high and minor pull-backs cannot be ruled out. Both the indices had left behind a Measuring Gap i.e. between Sensex 17664-17358 and Nifty 5323-5229. If we consider the start of the rally from Sensex 19131 and Nifty 5740, then the target for the downward rally was at Sensex 15891 and Nifty 4812. That target has been achieved both for the Sensex and Nifty. Both the indices have left behind a second Measuring Gap between Sensex 16433-16287 and Nifty 4932-4893. The target according to this gap falls at Sensex 13589 and Nifty 4085. The market is well below the short term average of 20dma (Sensex – 16987 and Nifty – 5108), medium term average of 50dma (Sensex – 17867 and Nifty – 5370) and long term average of 200dma (Sensex – 18677 and Nifty – 5605). As a result the short term, medium term and the long term trends continue to remain down. From a broader perspective the market is correcting the Sensex rise from 13219 to 21108 and Nifty from 3918 to 6338. The correction levels in that case are 18094-17163-16233 for the Sensex and 5414-5128-4842 for the Nifty. The 61.8% of the above mentioned rise coincided with the 38.2% level of the entire rise from 7697 to 21108 for the Sensex and 2252 to 6338 for the Nifty. This was aided by the 200 Weeks Moving Average and an intermediate bottom at Sensex 15960 and Nifty 4786 to form a strong support zone, which was breached last week. 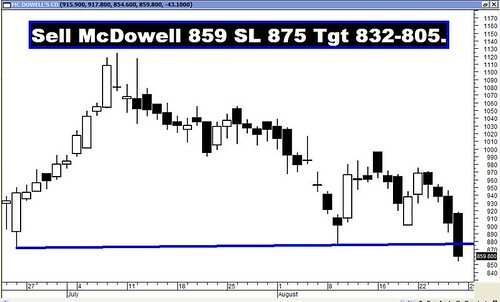 Now the market is likely to move towards the 50% and 61.8% levels of the entire fall for the Sensex and Nifty. Those levels are 14402-12820 for the Sensex and 4295-3813 for the Nifty. Majority of the oscillators are in Sell mode, while some are in oversold territory. MACD and ROC are both in negative territory and both continue with their Sell signals. RSI is at 24 and is in oversold territory. The Stochastic oscillator too is in oversold territory as %K is at 10. Directional Indicators continue in their Sell mode. ADX has increased to 44 suggesting that the current downtrend is getting mature. The Bollinger Band continues with its Sell signal. Money Flow has moved slightly higher at 26, indicating a divergence in the movement of the indicator. The other lead indicator OBV continues with its Sell signal as it continues to make lower top, lower bottom formation. Interestingly the weekly Stochastic and RSI are both in the oversold territory. Minor pull-backs cannot be ruled out from oversold levels, but they will not be construed as reversals. Call writing for the current month series is seen at 5000 strike price and Put writing is seen at 4600 strike. Huge addition in open interest is seen at 4300 Put. One can expect the Nifty to oscillate between 5000 on the higher side and 4600 on the lower side. The market might witness strong selling pressure if 4600 is breached. The next possible support will materialize only at 4300. For the week ahead, Sensex will find Support at 15463-15078-14677 and will find Resistance at 16210-16577-16943. For the week ahead, Nifty will find Support at 4627-4509-4392 and will find Resistance at 4865-4984-5110. Except for the third pair i.e. VIP Ind and OBC, none of the other pairs performed satisfactorily. Both VIP and OBC achieved their targets.